Here’s our fantasy premier league tips midfielders GW26 article in our player rankings series. There’s a table of stats to help you make your transfer choice. I’ve generally started with a selection of midfielders that I think will start GW26 and have some longevity in the team. SP/Pen: indicates whether the player has some set piece representation or penalty responsibility. Pen (2) means they are 2nd in line for penalties. PP90 mins adjusted: I’ve taken their Points per 90 for my projected minutes over the next 6. FFG Proj PPG next 6: The PPG for the next 6 resulting from my analysis as outlined above. Projected Mins: I’ve made an assessment on projected minutes for the next 6 based on the season so far. 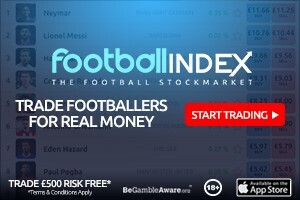 ATGS odds – 1 bookies anytime goalscoring odds for the player. It assumes they start and doesn’t include assist potential. The schedule ranks players by the FFG projected PPG over the next 5 games. I’ve only gone to GW30 as things will change at GW31. This will be a blank week for the FA Cup quarters. If difficult to read you can copy and paste it by using this link to the google spreadsheet. The spreadsheet should be easy to sort into the various columns as I’ve separated them out apart from the consistency fractions. 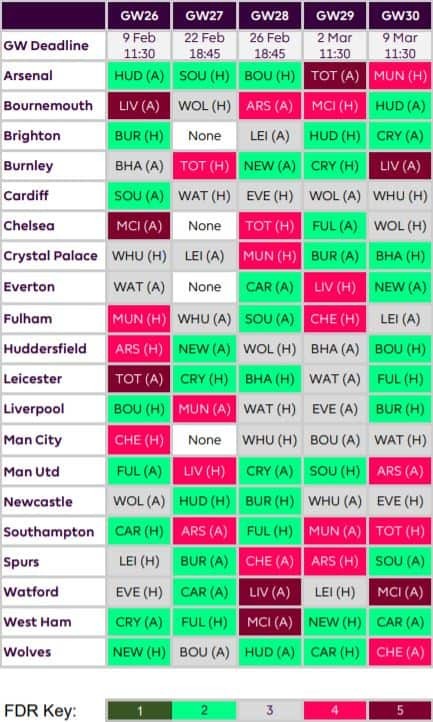 The players with no game in GW27, those being , Man City, Everton, Chelsea and Brighton have built into their projected point’s the fact that they play 1 game less over the 5 games.